ANGPTL8/Betatrophin Does Not Control Pancreatic Beta Cell Expansion. SUMMARY Recently, it was reported that angiopoietin-like protein 8 (ANGPTL8) was the long-sought “betatrophin” that could control pancreatic beta cell proliferation. However, studies of Angptl8?/? mice revealed profound reduction of triglyceride levels, but no abnormalities in glucose homeostasis. We now report that Angptl8?/? mice undergo entirely normal beta cell expansion in response to insulin resistance resulting from either a high-fat diet or from the administration of the insulin receptor antagonist S961. Furthermore, overexpression of ANGPTL8 in livers of mice doubles plasma triglyceride levels, but does not alter beta cell expansion nor glucose metabolism. These data indicate that ANGPTL8 does not play a role in controlling beta cell growth, nor can it be given to induce such expansion. The findings that plasma triglyceride levels are reduced by Angptl8 deletion and increased following ANGPTL8 overexpression support the possibility that inhibition of ANGPTL8 represents a therapeutic strategy for hypertriglyceridemia. Circulating Angiopoietin-like Protein 8 Is Independently Associated With Fasting Plasma Glucose and Type 2 Diabetes Mellitus. OBJECTIVE: Angiopoietin-like protein 8 (Angptl8) has recently been introduced as a novel adipokine/hepatokine that promotes pancreatic ß-cell proliferation and improves glucose tolerance in mouse models of insulin resistance. However, regulation of Angptl8 in human type 2 diabetes mellitus (T2DM) and renal dysfunction has not been determined. RESEARCH DESIGN AND METHODS: Serum Angptl8 levels were quantified by ELISA in 62 patients with T2DM as compared with 58 nondiabetic subjects in vivo. Within both groups, about half of the patients were on chronic hemodialysis or had an estimated glomerular filtration rate above 50 mL/min/1.73 m2. Furthermore, we investigated the effect of insulin and differentiation on Angptl8mRNA expression in 3T3-L1 adipocytes in vitro. RESULTS: Median [interquartile range] serum Angptl8 levels were higher in patients with T2DM (1.19 [0.37] μg/L) as compared with nondiabetic subjects (1.03 [0.47] μg/L) (P = .005). Furthermore, the adipokine/hepatokine was significantly higher in women (1.21 [0.47] μg/L) as compared with men (1.05 [0.44] μg/L]) (P = .013). In multivariate analysis, fasting glucose and T2DM but not renal function remained independent and positive predictors of circulating Angptl8 even after adjustment for markers of obesity, lipid status, and inflammation (P < .05). Furthermore, Angptl8 mRNA expression was induced by insulin and during adipogenesis in 3T3-L1 adipocytes in vitro. Conclusions: Circulating Angptl8 is positively and independently associated with T2DM and fasting glucose in vivo. Furthermore, Angptl8 mRNA expression is induced by insulin and during adipogenesis in 3T3-L1 adipocytes in vitro. Elevated circulating lipasin/betatrophin in human type 2 diabetes and obesity. Lipasin (also known as C19ORF80, RIFL, ANGPTL8 and betatrophin) is a newly discovered circulating factor that regulates lipid metabolism and promotes pancreatic ?-cell proliferation. Whether circulating levels of lipasin in humans are altered in a) type 2 diabetes; b) obesity and c) the postprandial state, however, is unknown. The current study aimed to compare serum lipasin levels in those who were a) non-diabetic (N = 15) or diabetic (BMI- and age-matched; N = 14); b) lean or obese (N = 53 totally) and c) fasting and 2 hours following a defined meal (N = 12). Serum lipasin levels were determined by the enzyme-linked immunosorbent assay. Lipasin levels [mean ± SEM] were increased by more than two fold (P < 0.001) in the diabetic patients (5.56 ± 0.73 ng/mL) as compared to the control subjects (2.19 ± 0.24 ng/mL). Serum lipasin levels were positively correlated with BMI (rho = 0.49, P < 0.001), and showed a 35% increase 2 hours following a defined meal (P = 0.009). Therefore, lipasin/betatrophin is nutritionally-regulated hepatokine that is increased in human type 2 diabetes and obesity. Elevated mouse hepatic betatrophin expression does not increase human beta-cell replication in the transplant setting. The recent discovery of betatrophin, a protein secreted by the liver and white adipose tissue in conditions of insulin resistance and shown to dramatically stimulate replication of mouse insulin-producing beta-cells, has raised high hopes for the rapid development of a novel therapeutic approach for the treatment of diabetes. However, at present the effects of betatrophin on human beta-cells are not known. Here we employ administration of the insulin receptor antagonist S961, shown to increase betatrophin gene expression and stimulate beta-cell replication in mice, to test its effect on human beta-cells. While mouse beta-cells, both in their normal location in the pancreas or when transplanted under the kidney capsule, respond with a dramatic increase in beta-cell DNA replication, human beta-cells are completely unresponsive. These results put into question whether betatrophin can be developed as a therapeutic for human diabetes. 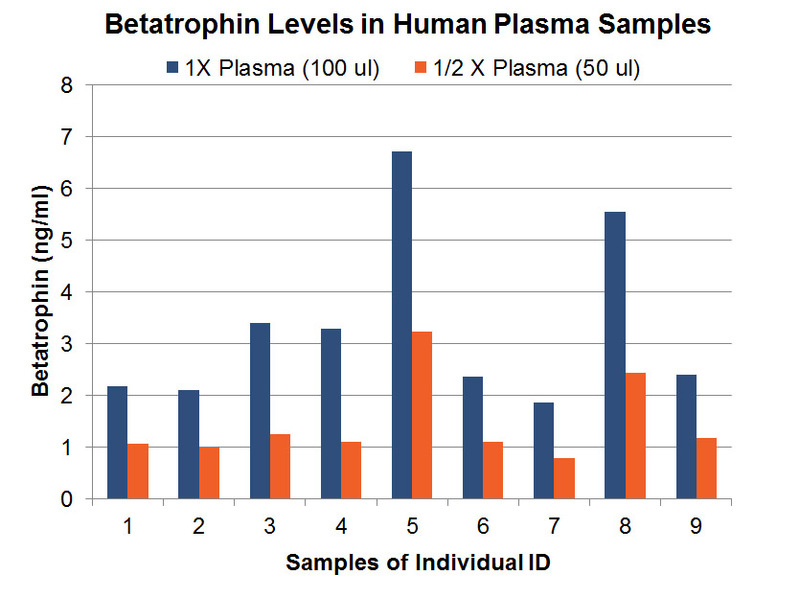 Detection of C-terminal Betatrophin Peptide in Human Plasma and Rodent Liver. Betatrophin protein, also known as heptaocellar carcinoma-associated protein TD26, has been identified as a specific hormone that promotes (1) pancreatic ß cell proliferation and (2) lipid regulation1. Methods were developed in this study to detect and characterize both the betatrophin protein and its C-terminal fragment in mouse liver, rat liver, and human plasma. Based on bioinformatics analysis, potential enzyme cutting sites were selected along the betatrophin protein. Peptide fragments corresponding to the N-terminal, middle, and C-terminal regions of the protein were prepared via solid phase peptide synthesis and antibodies were raised against these regions. Immunohistochemistry shows that liver cells are stained with the C-terminal betatrophin antibody. Western blot analysis shows the C-terminal betatrophin antibody is able to recognize both the 22 kD full length betatrophin protein as well as a smaller C-terminal fragment peptide in human plasma. The C-terminal betatrophin fragment can also be identified by HPLC and MALDI-TOF from the fractions subject to antibody-mediated affinity purifications. Furthermore, radioimmunoassays (RIA) and enzyme immunoassays (EIA) confirm the presence of C-terminal peptide in human plasma, with levels ranging from 0.4 ng/ml to 4 ng/ml. Immunoassays of liver tissue homogenates also indicate the presence of C-terminal betatrophin peptide with a level around 40.5 ng/g of liver tissue. In agreement with previous reports by Quagliarini et al2., we found that plasma betatrophin levels increased after refeeding. We also observed an increase of C-terminal betatrophin levels in plasma as determined by magnetic bead RIA. Although the sensitivity of EIA and RIA may differ, the plasma level of betatrophin was similar, irrespective of the assay procedure. In conclusion, our methods indicate the level of C-terminal betatrophin peptide in plasma may reflect an increase or decrease of full-length betatrophin metabolism. Jaw-Kang Chang, Rong-Ming Lyu1, Xiang-Qun Chen, et al., Japanese Peptide Symposium/APIPS2013 conference. Mice lacking ANGPTL8 (Betatrophin) manifest disrupted triglyceride metabolism without impaired glucose homeostasis. Angiopoietin-like protein (ANGPTL)8 (alternatively called TD26, RIFL, Lipasin, and Betatrophin) is a newly recognized ANGPTL family member that has been implicated in both triglyceride (TG) and glucose metabolism. Hepatic overexpression of ANGPTL8 causes hypertriglyceridemia and increased insulin secretion. Here we examined the effects of inactivating Angptl8 on TG and glucose metabolism in mice. Angptl8 knockout (Angptl8-/-) mice gained weight more slowly than wild-type littermates due to a selective reduction in adipose tissue accretion. Plasma levels of TGs of the Angptl8-/- mice were similar to wild-type animals in the fasted state but paradoxically decreased after refeeding. The lower TG levels were associated with both a reduction in very low density lipoprotein secretion and an increase in lipoprotein lipase (LPL) activity. Despite the increase in LPL activity, the uptake of very low density lipoprotein-TG is markedly reduced in adipose tissue but preserved in hearts of fed Angptl8-/- mice. Taken together, these data indicate that ANGPTL8 plays a key role in the metabolic transition between fasting and refeeding; it is required to direct fatty acids to adipose tissue for storage in the fed state. Finally, glucose and insulin tolerance testing revealed no alterations in glucose homeostasis in mice fed either a chow or high fat diet. Thus, although absence of ANGPTL8 profoundly disrupts TG metabolism, we found no evidence that it is required for maintenance of glucose homeostasis. Betatrophin: a hormone that controls pancreatic ß-cell proliferation. Replenishing insulin-producing pancreatic ß cell mass will benefit both type I and type II diabetics. In adults, pancreatic ß cells are generated primarily by self-duplication. We report on a mouse model of insulin resistance that induces dramatic pancreatic ß cell proliferation and ß cell mass expansion. Using this model, we identify a hormone, betatrophin, that is primarily expressed in liver and fat. Expression of betatrophin correlates with ß cell proliferation in other mouse models of insulin resistance and during gestation. Transient expression of betatrophin in mouse liver significantly and specifically promotes pancreatic ß cell proliferation, expands ß cell mass, and improves glucose tolerance. Thus, betatrophin treatment could augment or replace insulin injections by increasing the number of endogenous insulin-producing cells in diabetics. Emerging roles of Lipasin as a critical lipid regulator. Patients with metabolic syndrome are at high risk for developing atherosclerotic cardiovascular diseases and diabetes. In addition to total cholesterol, LDL-C and HDL-C, elevated plasma triglycerides (TG) are increasingly recognized as an independent risk factor for cardiovascular diseases. Recently 3 groups independently reported the identification and characterization of a novel blood lipid regulator, Lipasin/RIFL/ANGPTL8, which here is referred to as Lipasin for its lipoprotein lipase inhibition effect and for being a circulating factor denoted by 'in'. Being highly enriched in the liver, Lipasin is a hepatocyte-derived circulating factor that regulates plasma TG levels. Lipasin is nutritionally regulated, as its mRNA levels in liver and fat as well as its protein level in serum are reduced by fasting. Mice deficient for Lipasin have lower serum TG levels; conversely, its adenovirus-mediated overexpression increases serum TG levels, in part, through promoting ANGPTL3 cleavage, releasing its N-terminal domain that inhibits lipoprotein lipase. Lipasin sequence variations are associated with LDL-C and HDL-C concentrations in humans. Being lipogenic, Lipasin is highly induced during adipogenesis. Levels of Lipasin and ANGPTL4 show opposite changes in response to fasting or cold environment. Lipasin, a novel but atypical ANGPTL family member, is emerging as a critical lipid regulator and a potential drug target. Lipasin, thermoregulated in brown fat, is a novel but atypical member of the angiopoietin-like protein family. Hyperlipidemia is a major contributor to cardiovascular diseases. Members of the angiopoietin-like protein family (ANGPTLs) are important determinants of blood lipid levels. Lipasin, a newly identified gene that regulates serum triglycerides, is homologous to ANGPTL3's N-terminal domain, which is sufficient and necessary for blood lipid regulation. Brown fat is critical in mediating energy homeostasis. Thermogenesis is the primary function of brown fat, in which Lipasin and some ANGPTLs are abundant; it is unknown, however, whether these genes are thermoregulated. We therefore comprehensively examined the thermoregulation of Lipasin and ANGPTLs in brown fat. Here we show that Lipasin is a novel but atypical member of the ANGPTL family because it is within the same branch as ANGPTL3 and 4 by phylogenetic analysis. The mRNA levels of Lipasin are dramatically increased in the cold environment (4 °C for 4 h) whereas those of ANGPTL4 and ANGPTL2 are suppressed. Fasting dramatically suppresses Lipasin but increases ANGPTL4. High-fat diet treatment increases Lipasin, but reduces ANGPTL2. The distinct transcriptional regulations of Lipasin, ANGPTL2 and ANGPTL4 in brown fat in response to cold exposure and nutritional stimulation suggest distinct physiological roles for ANGPTL family members in mediating thermogenesis and energy homeostasis. The metabolic syndrome, a common disorder including glucose intolerance and dyslipidemia, poses a major public health issue. Patients with high blood lipids, such as triglycerides, are at high risk in developing atherosclerotic cardiovascular diseases. To identify genes involved in metabolism, we performed RNA-seq experiments on the liver and fat in mice treated with a high-fat diet or fasting, and identified Gm6484 (named Lipasin) as a novel nutritionally regulated gene. Human LIPASIN is liver specific, while the mouse one is enriched in the liver and fat, including both brown and white adipose tissues. Obesity increases liver Lipasin, whereas fasting reduces its expression in fat. ANGPTL3 (Angiopoietin-like 3) and ANGPTL4 are critical regulators of blood lipids. LIPASIN shares homology with ANGPTL3's N-terminal domain that is needed for lipid regulation, and with ANGPTL4's N-terminal segment that mediates lipoprotein lipase (LPL) binding. Lipasin overexpression by adenoviruses in mice increases serum triglyceride levels, and a recombinant Lipasin inhibits LPL activity. Therefore, a potential mechanism for Lipasin-mediated triglyceride elevation is through reduced triglyceride clearance by LPL inhibition. Lipasin is thus a novel nutritionally-regulated liver-enriched factor that plays a role in lipid metabolism. Atypical angiopoietin-like protein that regulates ANGPTL3. Angiopoietin-like proteins (ANGPTLs) play major roles in the trafficking and metabolism of lipids. Inactivation of ANGPTL3, a gene located in an intron of DOCK7, results in very low levels of LDL-cholesterol (C), HDL-C and triglyceride (TAG). We identified another ANGPTL family member, ANGPTL8, which is located in the corresponding intron of DOCK6. A variant in this family member (rs2278426, R59W) was associated with lower plasma LDL-C and HDL-C levels in three populations. ANGPTL8 is expressed in liver and adipose tissue, and circulates in plasma of humans. Expression of ANGPTL8 was reduced by fasting and increased by refeeding in both mice and humans. To examine the functional relationship between the two ANGPTL family members, we expressed ANGPTL3 at physiological levels alone or together with ANGPTL8 in livers of mice. Plasma TAG level did not change in mice expressing ANGPTL3 alone, whereas coexpression with ANGPTL8 resulted in hypertriglyceridemia, despite a reduction in circulating ANGPTL3. ANGPTL8 coimmunoprecipitated with the N-terminal domain of ANGPTL3 in plasma of these mice. In cultured hepatocytes, ANGPTL8 expression increased the appearance of N-terminal ANGPTL3 in the medium, suggesting ANGPTL8 may activate ANGPTL3. Consistent with this scenario, expression of ANGPTL8 in Angptl3(-/-) mice failed to promote hypertriglyceridemia. Thus, ANGPTL8, a paralog of ANGPTL3 that arose through duplication of an ancestral DOCK gene, regulates postprandial TAG and fatty acid metabolism by controlling activation of its progenitor, and perhaps other ANGPTLs. Inhibition of ANGPTL8 provides a new therapeutic strategy for reducing plasma lipoprotein levels. RIFL aims to be a new player in lipid metabolism. RIFL (refeeding induced in fat and liver) is highly expressed in brown and white fat as well as in liver. In white adipose tissue and liver, RIFL expression is induced by refeeding and is also elevated in ob/ob mice. The function of RIFL is unknown, and there is some evidence to suggest it may be secreted. RIFL expression is induced during adipogenesis in rodent and human model systems, and cellular knockdown and mouse knockout studies demonstrate that RIFL expression correlates with lipid levels. Overall, these studies indicate that RIFL is a new important player in lipid metabolism. Identification of RIFL, a novel adipocyte-enriched insulin target gene with a role in lipid metabolism. To identify new genes that are important in fat metabolism, we utilized the Lexicon-Genentech knockout database of genes encoding transmembrane and secreted factors and whole murine genome transcriptional profiling data that we generated for 3T3-L1 in vitro adipogenesis. Cross-referencing null models evidencing metabolic phenotypes with genes induced in adipogenesis led to identification of a new gene, which we named RIFL (refeeding induced fat and liver). RIFL-null mice have serum triglyceride levels approximately one-third of wild type. RIFL transcript is induced >100-fold during 3T3-L1 adipogenesis and is also increased markedly during adipogenesis of murine and human primary preadipocytes. siRNA-mediated knockdown of RIFL during 3T3-L1 adipogenesis results in an ~35% decrease in adipocyte triglyceride content. Murine RIFL transcript is highly enriched in white and brown adipose tissue and liver. Fractionation of WAT reveals that RIFL transcript is exclusive to adipocytes with a lack of expression in stromal-vascular cells. Nutritional and hormonal studies are consistent with a prolipogenic function for RIFL. There is evidence of an approximately eightfold increase in RIFL transcript level in WAT in ob/ob mice compared with wild-type mice. RIFL transcript level in WAT and liver is increased ~80- and 12-fold, respectively, following refeeding of fasted mice. Treatment of 3T3-L1 adipocytes with insulin increases RIFL transcript ?35-fold, whereas agents that stimulate lipolysis downregulate RIFL. Interestingly, the 198-amino acid RIFL protein is predicted to be secreted and shows ~30% overall conservation with the NH(2)-terminal half of angiopoietin-like 3, a liver-secreted protein that impacts lipid metabolism. In summary, our data suggest that RIFL is an important new regulator of lipid metabolism. Identification of genes differentially expressed in human hepatocellular carcinoma by a modified suppression subtractive hybridization method. To identify differentially expressed genes in human HCC in China, we applied a modified SSH method for cDNA subtraction. Such modification has made the method more effective for subtraction. We have obtained 36 and 24 differentially expressed cDNA fragments after modified SSH from 4 paired samples of human HCC and non-HCC tissues, respectively. Reverse Northern blotting analysis was performed to further identify the genes differentially expressed in the HCC and non-HCC tissue samples. There were 25 genes really overexpressed in HCC, and their corresponding encoding molecules may reflect the events of cell accelerated metabolism, proliferation, angiogenesis, anti-apoptosis, tumorigenesis (TLH107, TFH9) and the potential for metastasis. 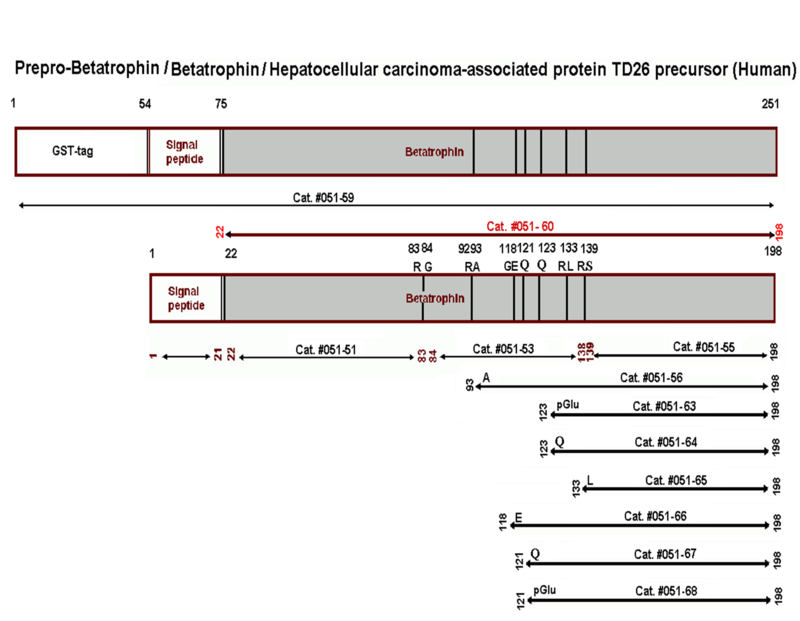 Of the 25 genes overexpressed in HCC, 5 were novel and their full-length cDNAs were cloned. These 5 novel genes are functionally associated with the occurrence and development of HCC according to the Database analysis. In the paired non-HCC tissues, there were 15 genes lowly or not expressed in HCC, and their encoding proteins function as tumor suppressors (TFA3, TFA11), acute-phase reactive proteins, and the blood plasma proteins that are mainly or exclusively synthesized in the liver. The distinct profiles of the differentially expressed genes in HCC and the paired non-HCC tissues have partially reflected the genetic alterations during HCC tumorigenesis. The novel HCC-specific gene TLH6 and the CT antigen encoding gene TLH107 may have diagnostic and therapeutic potentials in HCC and/or other solid cancers.